Shantel and the international acclaimed artist Oz Almog presents on KOSHER NOSTRA an unparalleled journey back in time to the music clubs, vaudeville theatres and gambling casinos in the U.S.A. The sound can be described as wild mix of Swing, Jazz, Twist, Charleston and the adorable charm of Yiddish songs and ballads. The idea of Jewish gangsters in America is not something that is deeply engrained in the popular imagination. Yet the character of Hyman Roth in Coppola‘s The Godfather is based on Meyer Lansky, one of the most colourful figures in the Jewish-American underworld. Films such as Billy Bathgate, Cotton Club, Once Upon a Time in America, The Godfather, Bugsy, Casino, Gangs of New York or the current HBO series Boardwalk Empire are a mix of legend, cliché, stereotype and historical fact. In Europe, especially, the widespread myth of a predominantly Italian mafia in America has long overshadowed the significance of Jewish gangsters. Yet nobody who looks into the history of the American mafia can deny the extent to which such figures as Meyer Lansky, Benjamin ‘Bugsy’ Siegel, Dutch Schultz or Louis ‘Lepke’ Buchalter shaped the machinations of the underworld, along with the classic Sicilian godfathers. It is only in the past ten years or so that any light has been shed on this in Europe. - In such hot-spots as New York, Chicago, Detroit and later Las Vegas, the music of Eastern European Jews fused with African-American jazz to create a new sound. 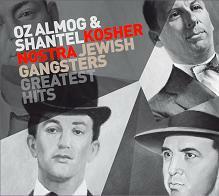 - Yiddish songs became incorporated into mainstream culture and became internationally popular. - Swing, a fusion of Black and Jewish musical forms, was the perfect vehicle for such musicians as Abe Ellstein, Benny Goodman, Dave Tarras, Sophie Tucker, Aaron Lebedeff and Al Jolson to go beyond the narrow confines of their own ethnic culture. The tracks on this anthology represent a parallel society made up of various ethnic scenes, all with their own media and a open-minded curiosity for new and exotic inputs from the WASP community on the one hand and the predominantly Catholic Irish and Italian communities on the other. This development of an aesthetic approach that crossed all ethnic boundaries spawned a music, film and musical industry in 1920s/30s America that quickly spread, with an impact that was felt even in Europe. In the course of his research, Shantel and Oz Almog unearthed some extremely rare gems: who knew, for instance, that Connie Francis had once recorded an entire album of Yiddish songs, or that Tom Jones had sung the praises of “his” Yiddish Mama? Shantel also explored the question of whether there was a musical milieu related to the criminal activities of the mobsters and which musical careers were launched or promoted at the time? What were the most famous and popular Yiddish songs at the time, and which dance rhythms prevailed? Anyone who has listened carefully to the music of the Bucovina Club in recent years is bound to recognise some of the melodies. This unparalleled journey back in time to the music clubs, vaudeville theatres and gambling casinos of the 1920s to 1960s bears compelling witness to the enormous diversity and truly remarkable fusion of styles. The anthology is accompanied by an informative and detailed essay, giving an introduction to the theme of KOSHER NOSTRA and introducing each of the artists featured.